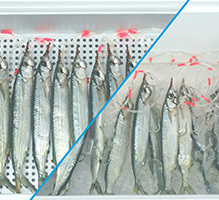 Our Hanging Bait Trays are the best way to keep bait fresh in a cooler. Unlike “floating” style bait trays that sit on ice and allow water from melting ice to ruin your bait, our hanging bait trays are designed and fabricated to hang from the ledge at the top of your cooler so your bait stays away from the water that ruins them. Fabricated from .080” satin anodized 5005 alloy aluminum. 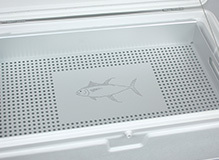 Our trays won’t rust, are light; and since aluminum is a much better conductor of cold than stainless steel, your bait stays fresh. The anodizing, which is actually etched into the metal, is a much better protector than powder coating. A truly custom fit. We designed each tray we sell on AutoCad and fabricate them on new CNC equipment to produce the trays to fit the coolers that are shown. No generic trays that may fit okay in some coolers, but not perfectly in any. Value that just won’t be beat. Since we manufacture the trays ourselves in a large (130,000 square foot) precision shop, we are able to produce the quality that you want at a price that you’ll love. Copyright © 2019 Ballyhoo Bait Trays. All Rights Reserved.